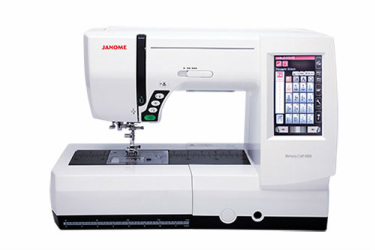 Janome's top of the line machine will do it all with great ease... embroidery, sewing, quilting and crafting. A quiet running precise linear track embroidery mechanism and wireless transfer of embroidery designs from the iPad directly to the edit screen of the machine makes decorating your projects a breeze. The 11 inch free arm allows for easy handling of larger quilts. 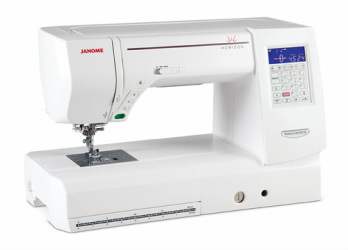 Janome's Acu Flex feed mechanism prevents shifting of multilayered fabrics with far better results than a conventional walking foot. The selection of stitches seems endless and is complimented with a stitch composer that lets you design your very own stitches. You can do it all with the new and exciting MC 9900. 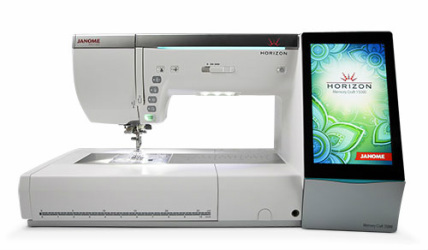 More compact than the top line machine but just as capable in sewing and embroidery, this model will bring out the artist in you with built in embroidery designs and stitches for garment sewing and decorating. 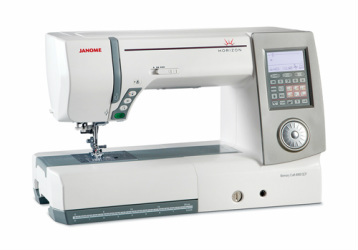 The 8000 series shares many exciting features with the much more expensive top of the line machine, such as the 11 inch free arm, the pop out exchangeable needle plates, the Acu Flex feeding system, the auto thread cutter and many more. Automatic tension, great stitch quality and easy operation makes it a purpose built quilting and crafting machine which takes your craft to a whole new level.